GP 1GB Internet 9tk via Power Load - this is a absolutely a great offer for all grameenphone users. This is another GP internet offer. If you're a GP user and if you have any Gp sim that not used any internet data last 6 months, then you can enjoy this awesome gp 1gb internet offer. This offer name GP Power Load. 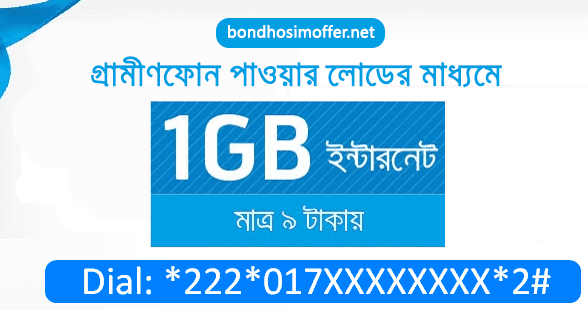 Grameenphone always give attractive bondho sim offer to their customers. Recently GP started power load service. By using this service an customer can enjoy some attractive offer. GP 1GB internet 9tk (Taka) is one of them. This is obviously a big gp 1gb internet package by Grameenphone. How to check GP 1GP internet 9TK offer? You must need to check you are eligible for gp 1gb internet 9 tk offer of. Well, this is very easy to check this eligibility. But you must need go to a Flexiload shop. Because gp 1gb internet 9tk offer can check by flexi load mobile. First go to a Grameenphone FlexiLoad shop and tell him, you wanna get a Powerload. The checking process is *222*017KKKKKKKK*2#. By dialing thi USSD code, you'll get a massage on your mobile. If you're available for this offer, then you can active unlimited time gp 1gb internet 9tk taka offer. Is gp 1gb internet 9tk by Power load for you? Yes, this offer is only for you, if you have an inactive gp sim that not used any internet connection from last 5+ months. Check this type of sim. Then gp 1gb internet 9tk offer get surety is high. Previous some days, we are published another article in Bangla on Techtunes. You should also check this out. I think you also get, this is an attractive grameenphone 1GB internet offer at 9TK. Bondhosimoffer is website, that publish all telecom offer, bondho sim offer in Bangladesh for all operation in Bangladesh. This is a great and outstanding offer by Grammenphone. If you any question about GP Power Load 9TK 1GB offer, then feel free to leave a comment on comment section. Thank You.